On Monday, July 31st at the Annual Appraisal Institute event, Julie Jones from Fannie Mae announced that as part of Fannie Mae’s updated Selling Guide, the 1004MC will no longer be required. While the Twittersphere wasn’t set ablaze with such breaking news, it certainly created a buzz in the room that is rippling across the appraisal industry. The 1004MC was created by Fannie Mae in 2008 in response to the subprime mortgage crisis of 2007 with the purpose “to provide the lender/client with a clear and accurate understanding of the market trends and conditions prevalent in the subject neighborhood.” Fannie Mae required this addendum for all appraisal reports effective April 1, 2009. Freddie Mac and FHA also adopted this requirement at the same time. Since it’s effective release in 2009, the 1004MC has undergone zero revisions. Technology companies reacted quickly and appropriately. All of the major form providers added the Fannie Mae 1004MC with ample time, including GeoData Plus. Our appraiser clients rely on us to provide the property data and sold comps necessary to complete their appraisals. 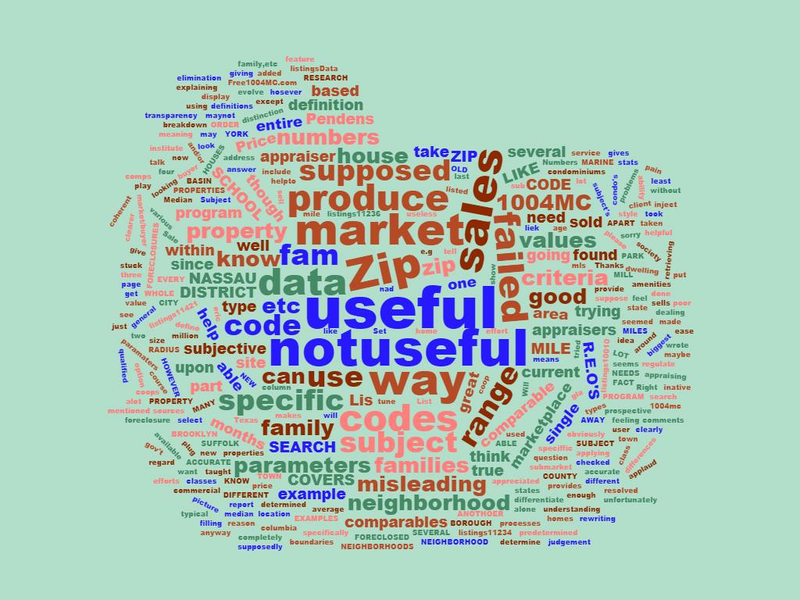 Rightly so, they looked to us to help us answer the question that caused so much uncertainty with the 1004MC: How do you define the subject neighborhood? After careful consideration with our clients, many of whom are thought leaders in the appraisal industry, we included an automated 1004MC calculation with every comparable search performed in GeoData Plus using the search criteria performed by the appraiser as the subject neighborhood. While you can never please everyone, our approach to the 1004MC calculation has generally received a positive reception over the years, as other data companies adopted a similar approach. Then we did something that was a little more controversial. Despite the sometimes colorful feedback we received on free100mc.com, the web site produced several thousand free 1004MC reports before we finally pulled the plug in 2012. When first released, the Fannie Mae 1004MC caused strong reactions amongst many appraisers. While that sentiment may have been tempered over time, it was never extinguished. Even in 2015 at a New York continuing education seminar on Collateral Underwriter when Bob Murphy, former Director of Property Valuation and Eligibility at Fannie Mae introduced himself, one of his first sentences included the paraphrased words “and I created the 1004MC”. Not only is Bob Murphy one of the great minds in valuation, he is also extremely brave. Before any celebration ensues, keep in mind that the Selling Guide is not published yet, nor have Freddie Mac and FHA removed the 1004MC as a requirement - although a spokesperson from Freddie Mac did imply that such a move would be likely. Furthermore, lenders may still choose to keep the 1004MC as a requirement of their own. Regardless of Fannie Mae's decision, GeoData Plus, for the foreseeable future, will continue to provide its clients with 1004MC data. We realize that depending upon its application, it can be a useful tool for appraisers, lenders, and other real estate professionals such as brokers and investors. GeoData Plus believes that the 1004MC report is another tool to providing insight and analysis to our clients, in turn assisting them in providing superior reports to their clients.